In recent years I have wondered what the word meek really means. I knew many associated it with gentleness and humility and that some saw meekness as an inherent lack in strength and character. I had a suspicion that some of this was wrong and that there was so much more to the concept of meekness. Recently as I have been seeking comfort and understanding from God as I experienced a particular trial, God has taught me more about meekness. I have come to realize that meekness is about submission; that is, meekness involves our patient endurance of suffering without resentment or bitterness. Meekness requires self-control and strength to resist giving into temptation during suffering. It also demands at least a measure of humility. Just as with other Christlike attributes, the development of meekness is reflected in our behavior and attitudes towards God and others, even though it is a condition of the heart. In other words, the amount of meekness we have can be measured by how we respond in situations involving suffering and how we react when we are treated badly. Meekness is not seeking to control a situation or others. Meekness is in essence, submission. The world has an incorrect understanding of submission. Submission is not about doing everything and anything another says. Instead, submission has to do with not seeking to control. Recently I was drawn to study 1 Peter and this entire book speaks about the concepts of submission and meekness (although the word meekness isn't used). In 1 Peter, Peter discusses the necessity of suffering as we traverse the path towards becoming more like Jesus. Trials and suffering are a common part of life. While we may not suffer daily, most of us have difficult experiences at least fairly regularly. These experiences are often out of our control and arise out of our interactions with others. At times they could involve losing something, such as a job, a home, or a loved one. They could involve painful interactions with another person, such as a difficult co-worker, spouse, or children. Trials can also result from not having something you really desire, such as sleep, health, children, marriage, or financial stability. Likewise, Paul referenced suffering as necessary in the learning of obedience to God (Hebrews 5:7-8), in the path towards perfection and becoming sanctified (Hebrews 2:10-11), in the development of humility (2 Corinthians 12:7), and in experiencing comfort from God and offering that comfort to others (2 Corinthians 1:3-6). I have also found that suffering increases my faith and trust in God and his plan for me (see 1 Peter 1:6-7). In essence, the purpose of suffering is to draw us to God. If we are consistently seeking to do the Lord's will, we can know that the experiences we have are for our good. They are a part of the path God desires we walk in order to grow. Everything he allows us to experience is a portrayal of his great love for us as he seeks to draw us to him. On the other hand, when we sin and seek our own way, sometimes we bring unnecessary suffering on ourselves, although that suffering is still useful, if not necessary, in bringing us back to God. When we suffer as a result of the words and actions of others, it is only natural to resist those experiences and try change the situation or people involved, or treat them in the same way they treated us. However, trying to control situations and people is not submission. It is not submitting to the path God has set before us so that we can learn obedience to him, increase our humility, receive comfort from him, and ultimately become more like him. It is not meekness. When we have difficult experiences that cause us suffering and pain, meekness towards God involves submission to the experience and seeking to learn exactly what he desires us to learn through that experience. It is trusting in Him that this experience is the best thing for us to grow closer to him and overcome our weaknesses and sins. Meekness involves turning to God for learning and comfort, instead of the world to change the situation to minimize our suffering. I have come to realize that often there is no other way to learn the things God is asking us to learn and overcome than through suffering. Recently as I was experiencing a particular trial, I was praying and I asked God if there was any other, less painful way I could learn the lesson he was trying to teach me. I then remembered Jesus in the Garden of Gethsemane asking his Father if there was perhaps another way. Very quickly Jesus knew there really was no other way to accomplish the Father's will and he replied, "Father, all things are possible unto thee; take away this cup from me: nevertheless not what I will, but what thou wilt." (Mark 14:36) Although my trial was not anything like Jesus', meekness towards God is having the same attitude: "I know I can do this because all things are possible with your help. I will do your will. I submit to you." As I have come to realize and accept the necessity of my really hard, painful trials in order to overcome my weaknesses, I know I ought be grateful for them. God in his incredible love for me is allowing me to have these experiences so I can draw closer to him. That is amazing! As I submit to the experiences, I can feel his love for me to a greater degree. While meekness involves submission to God in choosing to accept his will as our own, this attribute is also reflected in our behavior towards others. Meekness involves submitting to the actions of another while not seeking to control them. In 1 Peter 2-3, Peter discusses what submission means. Peter begins by speaking to servants, then to wives, followed by husbands, and finally to everyone. In examining how Peter describes submission, it is clear that submission is not about obeying another. Peter never mentions obeying another. The only person we ought to obey is God. God may tell us to do as another says, but in the end we are obeying God and not man. Peter wrote that it is so much more impressive when you respond well to undeserving harsh treatment at the hand of another, than if you respond well to harsh treatment you brought on yourself. Peter then says, "Likewise, ye wives, be in subjection to your own husbands" (1 Peter 3:1) As he begins speaking to each group, he says "likewise" meaning that the advice to the previous group applies to the following group. In other words, the instruction given to servants applies to wives and the instruction to servants and wives applies to husbands. When we experience a painful situation at the hand of another, too often we try and control them or the situation. Sometimes this control comes through the use of defense mechanisms. Other times we "render evil for evil, or railing for railing" (1 Peter 3:9). Perhaps we try and control another through giving them advice or constructive criticism. Regardless of how we respond, if we do not respond with love, we are not being meek and submissive. Years ago I knew someone who was frequently impatient with me or with situations involving me. These interactions caused me a great deal of pain. Instead of submitting to the experience, I braced against it. I tried to fight it. I sought to change this person so they would no longer be impatient with me. I used defense mechanisms both to protect myself and to try change this person, because in those situations I felt like I had no control. At some point I began working on myself and changing myself. At first I controlled my response in those situations and after many months I began noticing my heart changing. I no longer felt pain. I no longer felt like I was suffering. I began to feel love for this person. I stopped feeling the need to control in those situations. I am far from being meek though. Other situations and experiences have arisen in which I have resorted back to my desire to change the other person from treating me in a particular way. I offer unwanted advice. This is not loving. This is not submissive. I now see that each of these experiences are given to me by the Lord to help me increase in meekness. Responding only with love when we are being treated badly or go through some really difficult experience requires great self-control. It takes self-control (i.e. temperance) not to get angry or to retreat emotionally. While meekness involves not controlling God or others, it also always requires controlling ourselves and the way we react in difficult, painful situations. Peter continues his discourse on submission and says, "Yea, all of you be subject one to another, and be clothed with humility." (1 Peter 5:5) Self-control requires humility. It requires a reliance of God and not viewing ourselves as superior to others. Without a measure of self-control and humility, submission and meekness aren't possible. 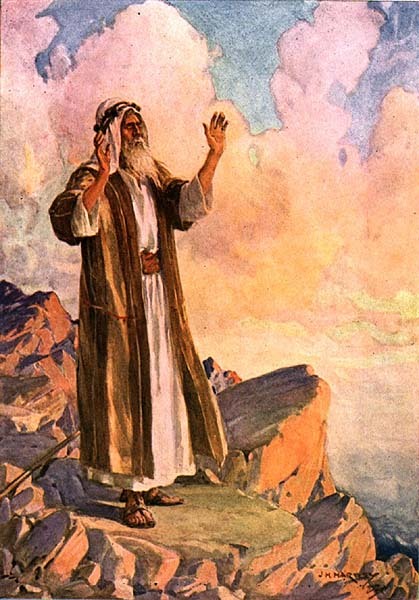 Apart from Christ, Moses is described as the meekest man: "Now the man Moses was very meek, above all the men which were upon the face of the earth." (Numbers 12:3) Moses was meek because he learned to submit to God's will, as opposed to doing thing his own way. When Moses first understood that he was called to help the Israelites be free, he went about it in his own way. Later though he understood what God's will entailed and did just that. Despite him having to leave his family to obey God and despite him suffering along with the Israelites in the wilderness, he ultimately submitted. Furthermore, he did not seek to control the Israelites. He allowed them to make bad choices but continued to teach and guide. He did not react to them in the same way they treated him and the Lord. He responded with love, which love is evident in his intercessory prayers on behalf of the people. Imagine asking God to blot your name out of the book of life if he did not forgive the people. Over and over again, Moses demonstrated his charity and meekness in his behavior and attitude towards God and the Israelites. Submitting to the wrongful treatment of another is a decision we make. Submitting to God's will is something we resolve to do. As we begin to do it, we will grow in meekness. Moroni wrote that meekness then leads to increased faith, hope, and charity. Through practice we can learn to better submit to God, not control others, and have greater self-control. Faith and love will flow from us as do this. I am far from being meek. At times I lack self-control. At times I forget to trust in the promises God has given me. At times I revert back to trying to control people. However, all the experiences of suffering we endure not only provide an opportunity to overcome our weaknesses and develop greater trust in God, but they enable us to develop meekness as we submit.